Slowly emerging from our turkey, buttery mashed potato, pumpkin pie whipped cream, coma, I felt the need to serve up something brothy and fresh…with a punch of flavor. I didn’t want to go the bland, healthy, detox cold turkey (so to speak) route. So opted for a more gentle approach to come down off the binge. 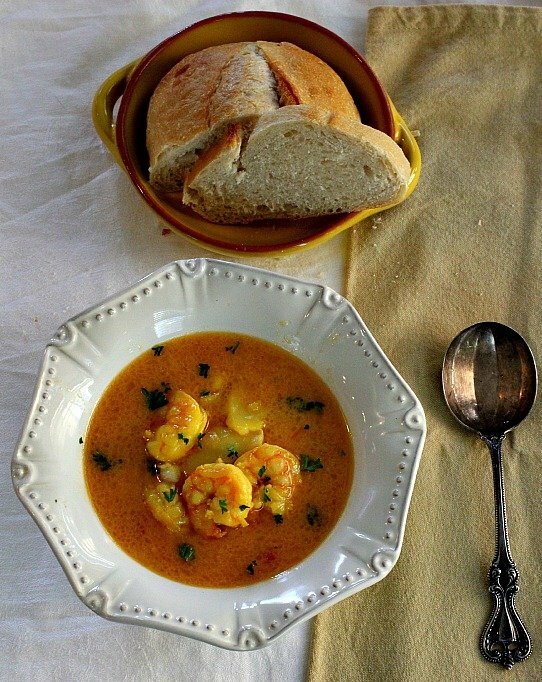 How about some Shrimp and Cod Soup…the French way. To enjoy French food, one must be able to enter the world of rich food with abandon. The French are certainly not afraid of butter, cream and heavenly rich sauces….Coq au Vin, Fois Gras, Bourguignon, Escargots and Croque Madam, Quiche, Steak au Poivre…no wonder Julia Child encouraged us to learn the methods. This French soup caught my eye as being on the gentler side of their cuisine. French Bourride with it’s fresh and bright saffron and white wine broth is exquisitely flavored with fennel, cayenne, garlic, leeks, tomato and bay leaf. 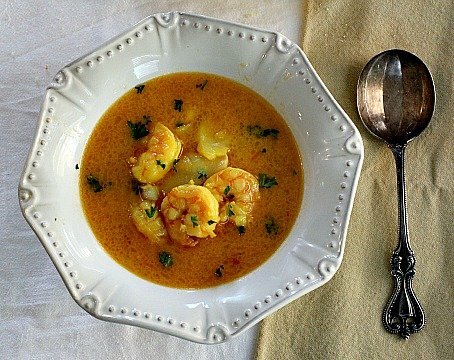 Homemade aïoli thickens the broth in this satisfying Marsellais stew made with cod and shrimp. Perfect in so many ways. Thanks to Saveur for this one. All this soup needs is a light and fresh salad. 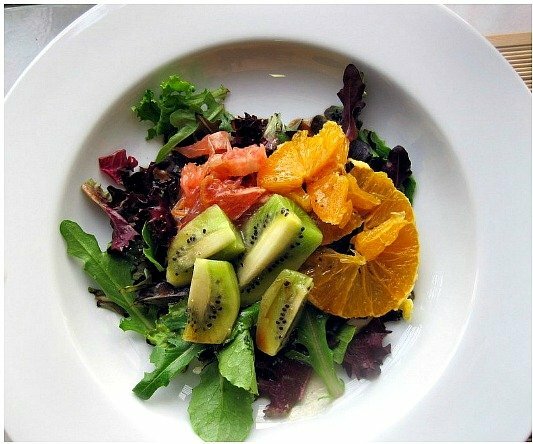 How about this Citrus Salad. Colorful with pink grapefruit, orange and green kiwi, you just feel good eating it. The dressing is a cousin to a Catalina and a perfect match for the fruit and the peppery greens. This French Bourride with it's fresh and bright saffron and white wine broth is exquisitely flavored with fennel, cayenne, garlic, leeks, tomato and bay leaf. 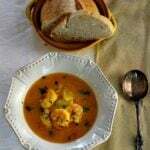 Homemade aïoli thickens the broth in this satisfying Marsellais stew made with cod and shrimp. Make the aïoli: Whisk lemon juice, garlic, egg yolk, and salt in a heatproof bowl set over a saucepan of simmering water until thick, 2–3 minutes; transfer to a blender. With the motor running, drizzle in oil until sauce is emulsified. Transfer aïoli to a bowl; set aside. Make the soup: Heat oil in a 6-qt. saucepan over medium heat. Add fennel, cayenne, garlic, leeks, onions, tomatoes, and bay leaf; cook until soft, about 15 minutes. Add wine; simmer until reduced by half, 4–5 minutes. Add stock and 2 cups water; boil. Reduce heat to medium; cook until broth is slightly reduced, 12–15 minutes. Strain broth; return to saucepan over medium heat. Add fish, shrimp, saffron, salt, and pepper; cook until fish is firm and shrimp are pink, 2–3 minutes. Using a slotted spoon, divide fish and shrimp between 6 bowls. Whisk 1⁄2 cup broth into aïoli; return to pan. Cook until slightly thick, 4–5 minutes; ladle over fish. Garnish with parsley; serve with toasted baguette. French Bourride Soup…It’s what’s for Dinner. I love it, and the color of the broth is amazing. I can taste the flavors. Thank you Amy. Isn’t the color wonderful? And tasty. Ah yes. The French cioppino. I don’t care what it is called. I would relish every spoonful! If this is a detox… then sign me up! This looks delicious! I know this soup! But have never had it in a restaurant, nor made it at home. I should — this is perfect. And great after all the heavy food we’ve been eating lately. Thanks! That’s exactly what I thought John… time to pull it back a little with the carbs. Though I’m not a huge fan of fish, I’d lap this right up! This looks and sounds like a really satisfying soup meal! It looks wonderful, Lea Ann! I love a good seafood soup or stew and the saffron in this has me sold. Yes you do RMW. 🙂 Always good to hear from you. I love this type of seafood stew! This is such a great mix of flavors, and I never turn down a dish with saffron. I agree Lisa. Saffron is a fun spice to use, for flavor and color. So good to hear from you. Seafood soup…oh yes, especially with the Aïoli. I saw this in your recipe round-up! I printed it and plan on making this soon with Pacific cod and shrimp. My hubby is a shrimp fanatic, lol.